Last week was Fashion Week in New York, a time for 99.99% of the city to go on with life as usual, while the other .01% (possibly less than that; I'm still waiting on a final statistic from the, uh, Fashion... Board) crams under tents in Bryant Park to watch the brilliant works of sartorial art head down very long runways. This weekend, I (very briefly) joined this tiny cross-section of New York culture and I went to a fashion show. The artiste was an Israeli lingerie designer, who went with a Bollywood theme, and whose show included four models and as many looks, and was over in maybe twice as many minutes. 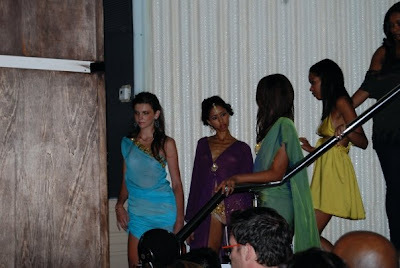 Now, this was my first fashion show, so I could be wrong here, but I always thought that these things were supposed to last as least as long as it takes to finish a cocktail, and include maybe 8-12 looks (because, come on, how else are we supposed to know what to wear), but perhaps minimalism is in this year. It was at least fun to get dressed up for it, and my companions and I capped off the night with milkshakes and onion rings at a nearby diner. Just like Yves Saint Laurent! Me. I am very different from models. A quicky for the lingerie models...perhaps there was a essage in the timing? !